1. The Vulgate of Jerome and the writings of Augustine and Aquinas bear witnesses to a widespread Christian understanding of the words of Exodus 3:14 as connoting absolute and eternal being (or existence). 2. Both Aquinas and Augustine state that the absolute ehyeh of Exodus 3:14b is a Divine name. 3. Certain of the absolute “I am” sayings of John (most notably those in John 8:58 and 18:5-6) are a reference to and translation of the absolute ehyeh of Exodus 3:14b and were understood by John and his religious community to be a Divine name. 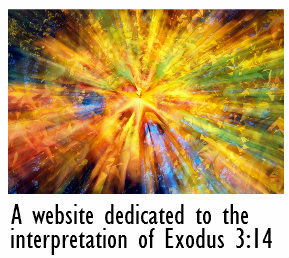 This represents the earliest recorded translation of the absolute ehyeh of Exodus 3:14b as “I am”. 4. There is a continuing recognition within modern Christian exegesis that the ehyeh of 3:14b connotes absolute and eternal being (or existence), and that it is a Divine name, and that it translates as “I am”.